CARACAS, Venezuela (CMC) — Haiti and the Dominican Republic have agreed to establish a joint commission to discuss the migration problem caused by a recent ruling by the Constitutional Court in the Dominican Republic that has the effect of rendering stateless, thousands of people of Haitian descent residing in the Spanish-speaking Caribbean country. 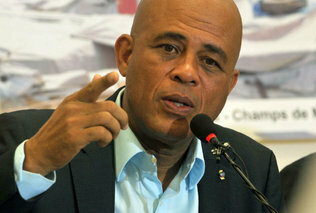 Haitian President Michel Martelly and his Dominican counterpart Danilo Medina met on Tuesday on the sidelines of a meeting of the Bolivarian Alternative for the Americas (ALBA) and of PetorCaribe The meeting was chaired by Venezuelan President Nicolas Maduro. “I announce the creation of a high-level committee with representatives of both sides to address various issues on the bilateral agenda,” Maduro said, adding that the joint commission would comprise five representatives each from the two countries. He said Venezuela, the United Nations, the European Union and the Caribbean Community (CARICOM) have been invited as observers. Maduro said the proposed commission would address issues regarding trade, migration, environment, security and the border. The purpose of such an initiative is to find a just, proper and balanced solution through which the interests and rights of all parties are protected. Last month, CARICOM said it would defer consideration of the application by the Dominican Republic to join the regional integration grouping following the Constitutional Court ruling. Leaders of the three-member CARICOM Bureau, comprising host country Trinidad and Tobago, St Vincent and the Grenadines and Haiti, said the 15-member regional grouping would also seek to raise the court ruling with several bodies including the Association of Caribbean States, the Community of Latin America and Caribbean States (CELAC) as well as maintaining “our interest and active participation at the Organization of American States (OAS). This entry was posted in Diaspora, Dominican Republic, Economy, Entertainment, Government, Haiti, Haitian, News, Reconstruction by admin. Bookmark the permalink.